With new technology comes new ways to customize t-shirts. As a person getting ready to order custom t-shirts you may have questions as to which method works best for you. This post will give you the answer in a nutshell. The last thing you want to do is to invest money in a product that doesn’t turn out how you expect. Here you can find the answers you didn’t know existed. An ancient method of printing adopted to print custom t-shirts. This method is by far the most popular and even with the advent of new technology, the largest brands and companies in the world still want their shirt brands screen printed. It’s a shirt printing method where each color in a design is printed separately using inks and a printing press. Think Harley Davidson, Hurley, Adidas, Ralph Lauren, etc. These companies have screen printing companies print their brands on their t-shirts. When you are talking bulk of any kind, be it 12 shirts or 12 million shirts, screen printing is the most cost effective. In addition to price, screen printing is also the most versatile and durable method as well. Light shirts, dark shirts, and everything in the middle can be screen printed. Screen printing is a method that can use a variety of inks specifically formulated for screen printing. However these different inks and additives can give a client the look and feel they desire. It’s the most economical process and the setup is the same on each order. It relies on a screen, a press, a squeegee, and ink. If we screen print 12 shirts or 12,000 shirts, the setup is the same. The process is the same. It’s the most durable cost effective custom t-shirts solution available. Due to the setup, the only time screen printed might not be recommended is on orders of 1 or 2 t-shirts. Once a shirt is printed it’s sent through a belt dryer so that as many shirts as possible can be printed in a shirt period of time. 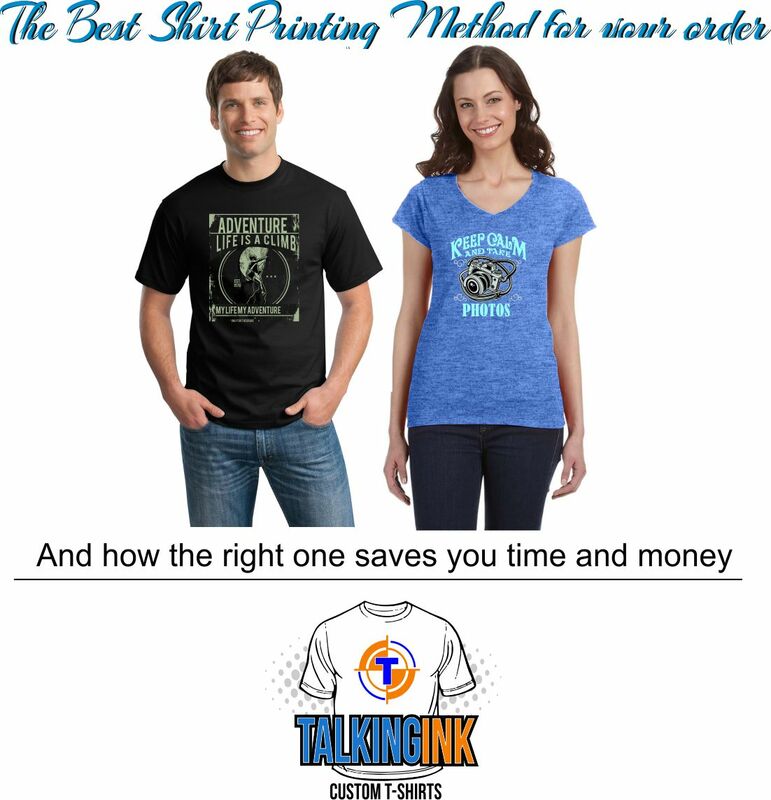 This is the most cost effective and efficient shirt printing method. It’s history and popularity will keep screen printing as the front runner for custom t-shirts. 99% of people wanting to order custom t-shirts will want to use the screen printing method. Keep this is mind when choosing the right shirt printing method for your order. This is a newer technology that certainly has it’s place in the custom t-shirt world. With this method shirts are printed in a machine that looks like an oversized desktop printer. Once the shirt goes through the printer it is then heat pressed to cure the ink. There are some printers than can print a few shirts at one time. However the process of having to heat press each individual shirt is still neccessary. So there is a lot of time involved and time equals money. It’s not the method to use if you want bulk order shirts. If you want one or two customized shirts, then this is the method you’ll want to look at. The other down side in addition to cost is that direct to garment printing is best performend on light colored shirts. Dark shirts are still a thing that hasn’t’ been perfected yet. Dye subliation is a method that’s been around for a while. It’s actually a printed method we use on our custom coffee mugs and a few other promotional items. It works great on t-shirts as well. This is a method where a specifically formulated ink is printed on a proprietary sheet of paper and heat pressed onto a shirt. The ink is made to actually infuse into to fibers of the shirts for a soft hand feel. It’s a process that rivals screen printing in time due to it’s short set up time. However the printing itself lends itself to be more of a smaller order printing process as opposed to bulk order printing. Another down fall is that dye sublition is limited to white and very light colored shirts. Even then the shirts need to be 100% polyester or a blend of at the very least, 50% poly. The cost is a little higher per piece compared to screen printing as well. Keep in this mind when choosing the right shirt printing method for our custom t-shirts. If you are in the market for custom t-shirts with a quantity of 6 or more pieces you’ll want to look at screen printing first. Generally it’s a viable method unless you have a ton of print colors. Since both direct to garment and dye sublimation printing methods have specific parameters that need to be followed in order to make them a viable option, screen printing is the most popular custom t-shirt printing method. You get a better cost per piece, a more durable product, and none of the limitations the other printing methods have. Choosing the right shirt printing method can make all the difference in the world.